This beautiful fabric features a black on white toile pattern. Makes a striking statement in any color bath! 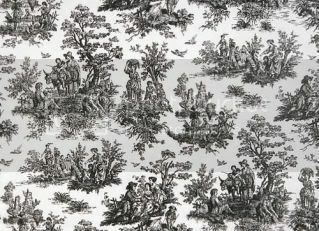 This is a heavy cotton fabric with a beautiful country life toile motif. Shower curtain measures 72x72 with deep weighted hem, buttonhole top and pattern matched.